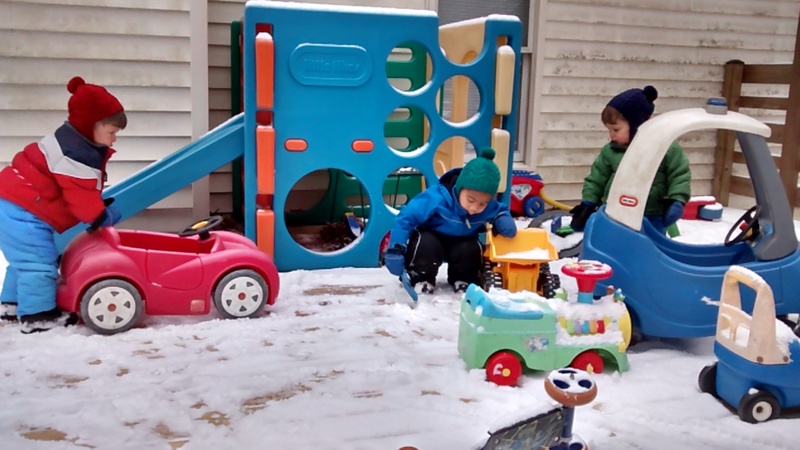 It took me 32 minutes to dress all my toddlers in snow gear – for HALF AN INCH of snow. Half an inch of snow made me sweat like the mom in “A Christmas Story” – but she only had one kid to wrestle into a fluffy snowsuit. Oldest son bursts into my room, saying, “It snowed!” Commence begging to play outside. I mentally berate myself for promising him I would take him out. How am I going to get all these kids into snow gear? I know it’s only half an inch, but it’s so cold that they really need snow gear. Where is all of our snow gear? I kinked my neck again last week by hoisting a huge twin over a baby gate and how am I going to have the strength to wrestle their fat bodies into snow gear? Maybe he’ll forget. It is warmer outside, the sun is up, the twins are going stir-crazy, breakfast is finished and cleaned up, and I have no right to stall any longer. I give myself a mental pep talk. I can do this. I can do this. I’m like a football player coming out of a huddle. I’m a bull snorting and about to charge. I’m a soldier. Hoo-ah! Commence Operation Search for Snow Gear. I empty the hall closet of everything we might need. I find three winter coats in semi-appropriate sizes, and two pairs of boots. Miraculously, I find last year’s waterproof mittens in the bin labeled “mittens”. I whisper, “Good girl” to myself (even though it was probably my husband who put them there). I leave some twin fighting to run upstairs to find more gear. I can hear my oldest son begging for me to find the sled. I shout down that there isn’t enough snow for a sled. He shouts that there is enough snow. I shout down that I can’t reach the sled because it is high up in the garage. He shouts back that I can “just use Daddy’s ladder”. My brain feels like a ping pong ball. I frantically search the kids’ closets for snowpants. I find a thrift-store pair two sizes too large for my oldest (Size 7), and congratulate myself on my forethought. In the twins’ closet, I find two pairs of much-too-small snowpants (18 months). I realize that I have to either box them up or donate them or sell them, and a wave of sadness washes over me. I pity myself for just one minute because my babies are growing up so fast! They will never wear these cute little snowpants again. Were they ever this small? Woe is me. Pity party over. Back to my oldest son’s closet. In the way way back, I find two pairs of snow pants that are too small for him, but perfect for the babies (sizes 3T and 4T). I mentally congratulate myself for never cleaning out his closet. “Good girl,” I whisper to myself. I run back upstairs for three pairs of socks. I wonder if it’s worth keeping a sock bin downstairs beside the shoe bin. I mean, seriously, why are our socks upstairs in dressers, but our shoes are downstairs in bins? In fact, why don’t we keep all our clothes downstairs, like the “19 Kids and Counting” family on TLC? Screw dressers. I survey the enormous pile of gear on the floor. It looks like the back of a Goodwill truck. I feel overwhelmed and want to quit. I know it will make me sweaty to do this. I know I will hurt my neck again. Sadly, I note that there are only two pairs of boots. I mentally thank my mother-in-law for giving those boots to the twins for Christmas, but mentally scan the house for one more pair. 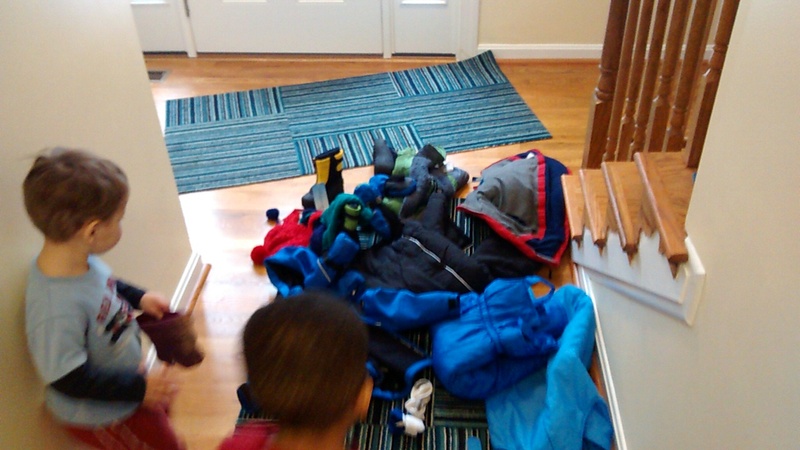 I futilely ask my oldest son to go find his snowboots. My oldest son wanders the house and cries because he can’t find his snowboots. I look in the closet again. I run upstairs to his closet. We can’t find them. I start to panic. Half an inch of snow doesn’t really need snowboots, but he was just so excited about those used junky snowboots that he can’t accept wearing boring old shoes. No amount of convincing will help. Commence Operation Put Snow Gear On. I start with my oldest. He is the most excited, and thus, the most vocal. The sooner we get him in his gear, the sooner he can go outside and give me some peace. I pour him into his too-big snowpants, making sure the twins are watching and understanding just how awesome snowpants are. Mittens on. Why are you a limp noodle?! Make your arm straight and push! No, don’t punch me! Just push! Coat on… Nevermind. Mittens too big. Must take mittens off and put coat on first. Now mittens again. No, don’t punch me! Just push! Socks on. Boots on. Here, sit in my lap, maybe that will be easier. Push your feet! Maybe we should stand up. Stand up and push! No, don’t stomp on me. Just push. Why are there so many straps? This Velcro is all worn out. Maybe I should have sprung for new boots for him. Hat on. I silently thank my best friend, who, despite living in California, knitted them the most adorable and soft and warm hats ever. Oh, it’s backwards. Here, now you can see. Is that better? Okay, please go out on the deck! And take the dog! For the love of all that is holy, please get the dog out of here! Phew. I am sweating. But our numbers have been reduced by 50%, and thus, so has our noise and chaos level. The twins are dancing around me and starting their slow keening wail of jealousy that they can’t be outside yet. Twin B opens the door and defiantly follows my oldest outside in the snow. He is surprised by the cold! Thank goodness he’s in bare feet so I don’t have to get new socks. I haul him back in. I start with my Hurricane Twin B. I sit him in my lap and pull his snowpants on. He freaks out and acts like I am dressing him in tin foil. He does one amazing ninja move off my lap and out of his snowpants. He kind of acts like a snake shedding his skin in fast-forward. How did he do that? Okay, fine, you don’t like snowpants? This is where having twins comes in handy. I will simply dress your brother and make you jealous. I sit agreeable Twin A in my lap and proceed to pull on snowpants. He doesn’t like it, but he lets me do it. I make sure Twin B is watching so he can see just how cool snowpants are. Mittens on. Kind of. Where is your thumb? Do you have a thumb? Good thing your hands are the size of a college sophomore, because I actually get your mittens on. Coat on…. Wait. Mittens too big. Coat off, mittens off, coat on, mittens on. Hat. 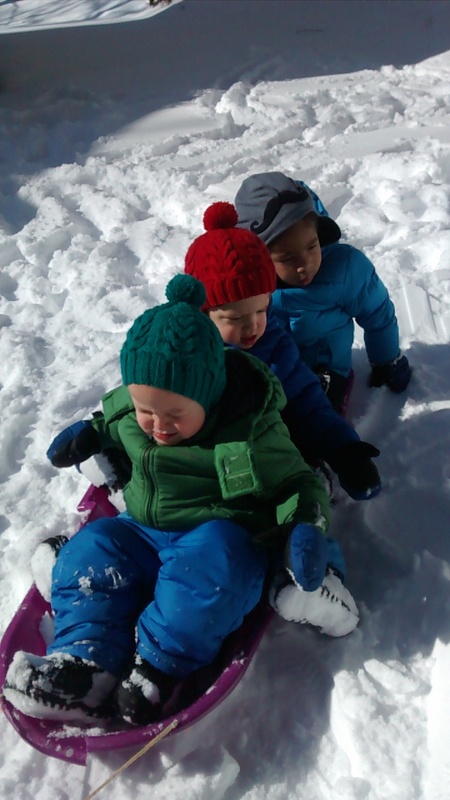 Twin B is crying out of jealousy or regret or irrational fear of snowpants– I can’t tell. Okay, new snowboots. Twin A looks at them warily. Stand and push. Is your foot in there? Oh, well, when you start walking, your foot will probably settle down in there, right? You can’t walk? Okay, then, push!!! Push! For heaven’s sake, push! Okay. Done. Can you walk? Okay, just go on the deck. You certainly won’t get very far in that poofy outfit. I am sorry I will miss your adorable reaction to the snow, but I have to deal with your twin. 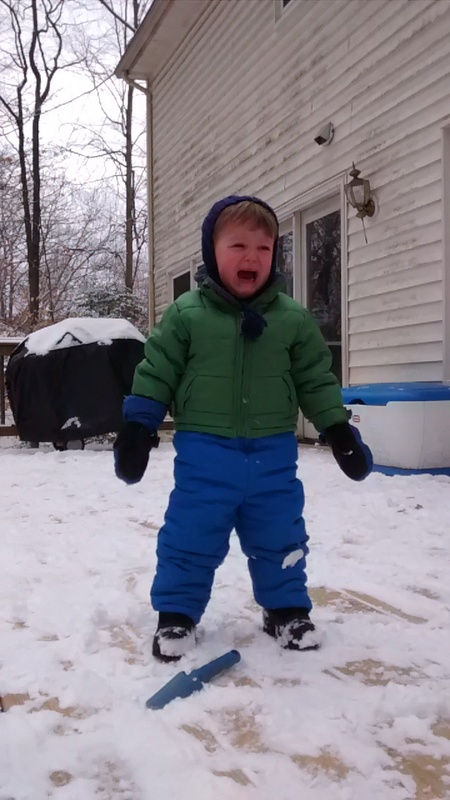 I turn to crying, angry Twin B. It’s snowpants time. Yes. Yes. You’ll be fine. These are special pants to wear in the snow. Aren’t they great? See, brother is wearing them! And other brother is wearing them! Don’t you want to wear them? I berate myself for encouraging herd mentality. Am I setting him up for a life of peer pressure and drugs? He finally lets me put the snowpants on when he realizes there is a zipper – his new favorite thing – and that I will let him zip them. It takes about five minutes for him to work on that “zap zap”. That’s cool. I needed to stop sweating for a minute anyway. I look out the back door to check on my slow-moving meatballs out there. Mittens on. Kind of. Where is your thumb? Do you have a thumb? Seriously, there is no way that tiny thumb is ever going to be found. Oh well. Coat on… wait. Mittens too big. Coat off, mittens off, coat on, mittens on. Where the heck is your thumb? Hat on. He hates it. Hat off. Oh, no you don’t! Hat on. He takes it off. I win by putting it back on and tying it in a knot under his chin. I briefly wonder if it will choke him if he pulls his hat off. Boots on. Thankfully, Twin B gets super excited by any and all new shoes, so these are a breeze. They even have zippers for him to play with, although he can’t really bend over to try it. He gets frustrated. Hurry, let’s get outside! I usher him out the door to join his brothers. I have no shoes on. I have no coat or hat. It is 25 degrees. I go back in to throw a coat on over my bathrobe, a hat over my unwashed ponytail, and unlaced boots over my slipper socks. I look like Cousin Eddie from Christmas Vacation. I wish someone was here to laugh at that. I’m so witty. I can breathe now. I can sit down and rest on this snowy patio chair and watch my beautiful children enjoy their first snow of the year. It will be so peaceful and joyful. Don’t worry: He got to use the sled during the next snowfall. I was lucky enough to be present at the next day’s foray outside, and I can attest to the truth of this craziness!